An interesting piece caught my eye the other day that I felt worth exploring here. Research by nScreenMedia revealed a significant fall in in pay-TV subscribers in 2017, with the top seven public operators losing a combined 2m subscribers over the year – the worst subscriber loss for the pay TV space ever. Both telco and satellite also saw a similarly dramatic shift in fortunes. Interestingly, nScreenMedia’s research and analysis show that viewers aren’t just leaving traditional models and flocking to online only services. Whilst these digital service providers and aggregators are certainly the largest beneficiary of the TV exodus, many of them - including even giants like YouTube - are struggling to remain profitable, which in turn encourages more aggressive pricing strategies that attract even more people away from their expensive traditional packages. So, the challenge for TV providers has to be how to stem the flow of users away from their services. In many cases, given the comprehensive nature of what they provide (and this is particularly true in the case of telcos and satellite providers) competing on cut down pricing is not a realistic option for a full fat service. But something we heard Ben Keen say at Streaming Forum last week grabbed our attention – he noted how the Now TV platform has helped Sky grow its overall customer base despite a slight decline in its premium subscribers. 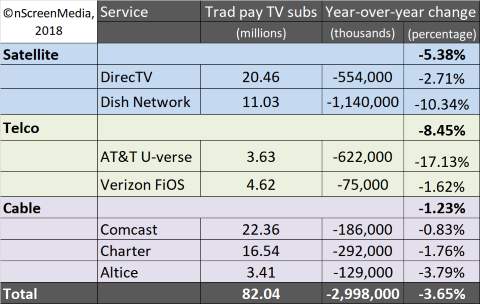 This demonstrates that cut down offerings that are competitive on price while providing a strong range of premium content, could suddenly become very compelling to a range of pay-TV providers, satellite providers or telcos. Obviously, this would not be an overnight launch, distribution deals take time, as does building the backend infrastructure required to deliver these kind of digital first services, but the opportunity is there, and Sky have proven it can reverse help address customer exodus. Sky were incredibly prescient with their deployment of Now TV, seeing that at the point when ‘full fat’ subscription packages start plateauing it would be better to have their own ‘skinny’ alternative available, rather than have customers go and pay someone else for that solution. Very few broadcasters or service providers have this kind of distribution platform in place at present, and it cannot appear overnight. As a result, nScreenMedia’s analysis that 2018 will not be the year that slows the exodus of customers away from expensive pay-TV packages is likely entirely correct. However, 2018 can also be the year where more telcos, satellite and pay-TV providers build the backend infrastructure needed to deliver these more flexible digital first services. In this sense, the backend architecture becomes a key sticking point, as traditional and new digital workflows need to be unified in order to enable the rapid movement of content from one to the other. I’m not proposing this to be a silver bullet, but it is definitely a key piece of the puzzle when it comers to keeping users attached to an existing brand in the face of the onslaught of new digital only service providers. Piksel will be demonstrating our solution to this media publishing challenge, Fuse Publisher, at NAB this year. If you’d like to talk to us to understand how this platform can help enable rapid publishing from traditional TV workflows to a huge range of digital endpoints, as well as satisfying other media publishing needs, get in touch below.